Feeling paranoid? giant loop's quickloop cables (36? and 84?) and onguard's bull mastiff padlocks provide peace of mind. Our great basin saddlebag and siskiyou panniers feature cable pass-throughs, so riders can secure their luggage to a parked motorcycle with the 84? quickloop cable. The 36? quickloop cable is the perfect size for locking helmet or riding jacket to your bike. For easy storage, giant loop's quickloop cables roll up intopact coil with an included hook-and-loop strap. 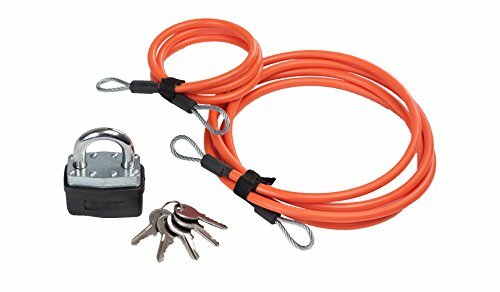 The bright orange vinyl cable sheath not only protects the bike's finish from scratches, it also provides high visibility conspicuity that says, "this gear is locked down" - keeping the opportunistic grab-and-dash thief away and moving on to an easier target. If you have any questions about this product by Giant Loop, contact us by completing and submitting the form below. If you are looking for a specif part number, please include it with your message.